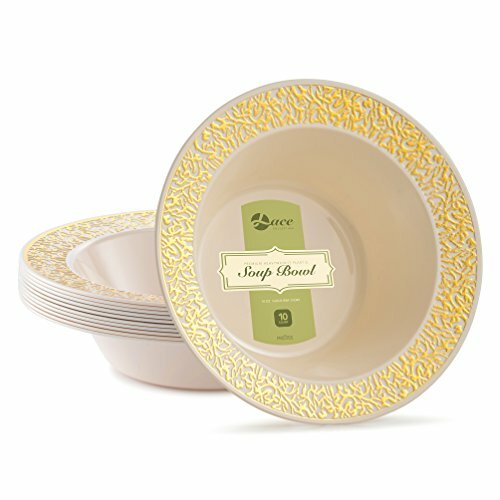 Host your next affair in chic white plastic plates with round gold rim to add a touch of elegance. 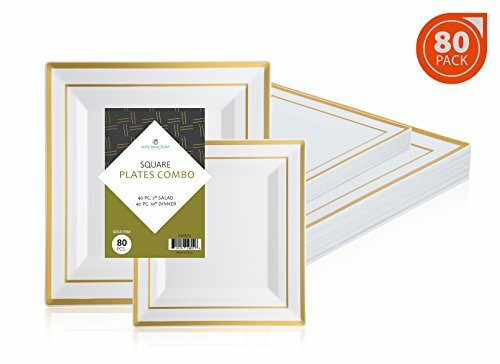 Composed of heavyweight plastic, these hard plates will not sag or break while serving, eating, or handling, yet function as disposable plates that can be tossed after the event. If reuse is desired, hand wash with soap and warm water, as dishwasher load may remove metallic trim. Choice for fine dine occasions like weddings, dinner parties, holiday meals, showers, receptions, birthdays and more. Combine with the rest of our Deluxe Collection and have your party looking great in no time!! Host in style and comfort combined! As quality disposable plates, our lace collection provides a solution to the demanding care of china, including breakage, transport and cleanup. 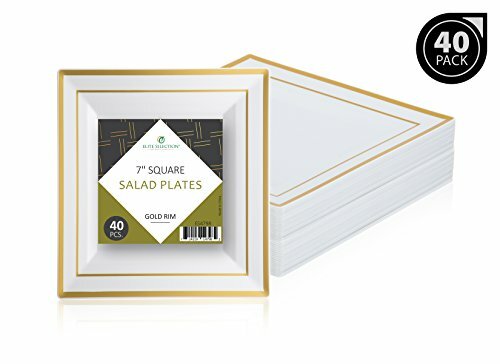 These elegant plastic plates are great for weddings, family get-together and other upscale affairs where you need to impress without having piles of dishes to wash later. Lay them out by each place setting or put a stack on the buffet table. 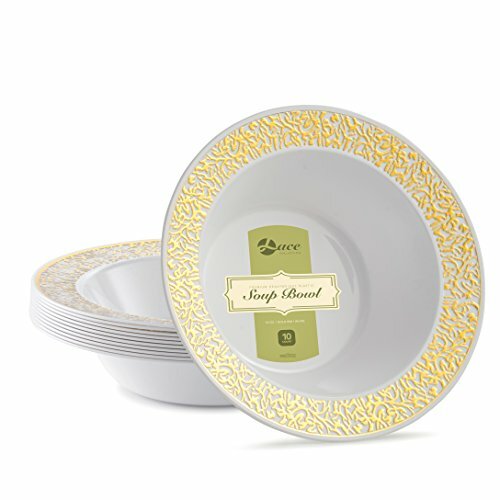 Whatever the use, white plates with lace gold trim, are sure to turn the ordinary into the extraordinary. MAJESTIC 14-Oz. 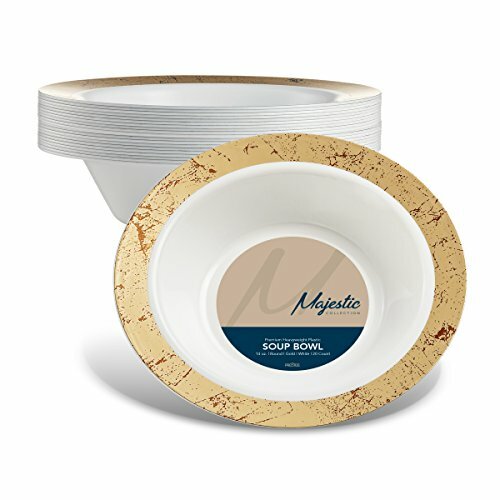 Plastic Soup Bowls | 20 Pack | White with Gold Speckled Rim | Disposable | For Weddings, Parties, Holidays & Occasions. Serve your guests in gold plastic plates with speckled design border for an upscale dining experience. 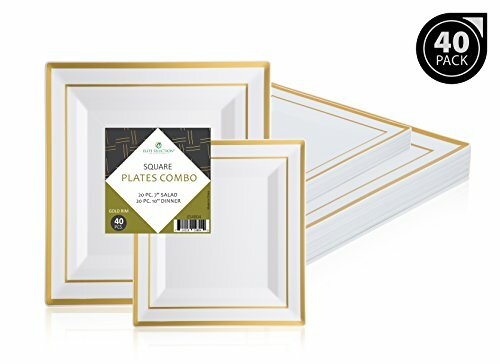 These plates are perfect for occasions like weddings, holiday meals, anniversary parties and more. Hard plastic plates are disposable so you're not left with piles of dishes once your guests have left, yet they are durable enough to be enjoyed and reused again and again. Pair with the rest of the Majestic Collection for a rich table setting. Host in style and comfort combined! 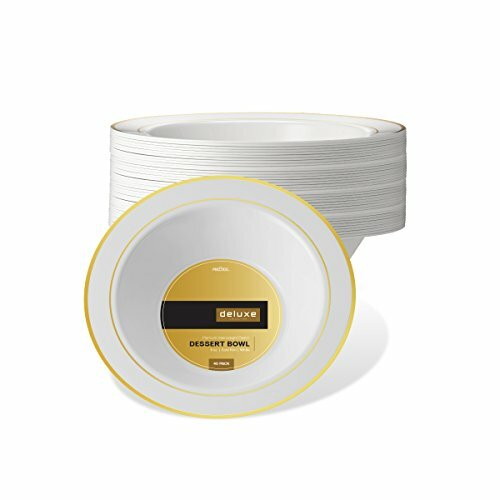 As quality disposable plates, our lace collection provides a solution to the demanding care of china, including breakage, transport and cleanup. 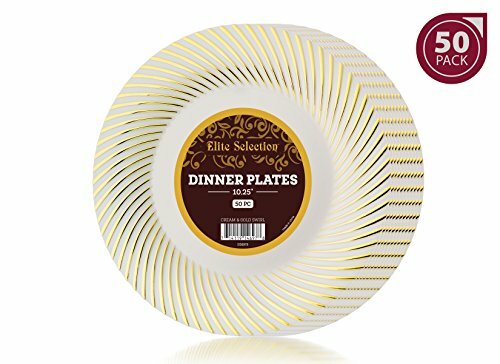 These elegant plastic plates are great for weddings, family get-together and other upscale affairs where you need to impress without having piles of dishes to wash later. Lay them out by each place setting or put a stack on the buffet table. Whatever the use, ivory plates with lace gold trim, are sure to turn the ordinary into the extraordinary.